Before I knew how to make cherry pie recipes or what type of cherry to use, I knew they tasted so good. Sister Gloria was married before I was born. Remember I was the fifteenth child of Mom and Dad’s and Gloria was one of the older siblings. Gloria and her husband bought a little white house with several cherry trees in the front yard. We would sit in the trees and eat all the cherries we wanted. Whoever knew these were the “tart” pie cherries? They tasted so good to us! As I was learning how to make cherry pie recipes, I found that cherries come in a thousand varieties. They are divided into two categories; sweet and sour/tart cherries. Sweet cherries are usually used for eating fresh, right off the tree. Sour cherries are used more for cooking and BAKING PIES and usually are a bright red color. If you are interested in healthy eating, the sour cherries are the ones for you! The sour ones contain higher quantities of fiber, vitamins A and C and beta carotene. Some of the sweet cherries are known by Stella, rainier, black tartarian, tutare, glenare and the ever popular Bing cherry. A couple sour cherries are Montmorency and the most popular pie cherry is morello. Do not get confused by the maraschino cherry. This is not a type but a name after processing. These are made from a sweet cherry (Often the Royal Ann cherry) and are preserved in a brine with red food coloring added. When learning how to make cherry pie recipes I came across recipes using “ground cherries”. So, what are ground cherries? This was something new to me. Some people described ground cherries as being like small tomatoes or tomatillos. Perhaps this is in appearance but I think not in taste. Little yellow berries grow inside husks about the size of large blueberries. The husk will turn from green to brown which signals “ready to pick” ripeness. You can feel the little ball inside so simply pull off the husk and discard it to eat the fruit. Although some say they taste like tomatoes, they are sweeter and have more of a “fruity” flavor; maybe like pineapple. 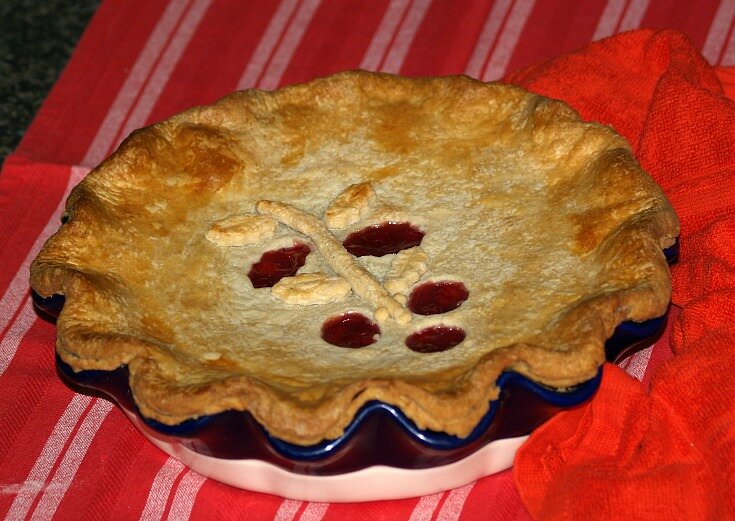 Learn how to make cherry pie recipes for Crisco’s prize winners. This was the Grand Prize cherry pie recipe in Crisco’s (shortening) contest in 1991. Crisco is a product of Proctor and Gamble based in Ohio. The creator of this pie is Diane Cordial of Powell, Ohio. It was judged against pies from forty nine other states. TO MAKE FILLING combine sugar and cornstarch in a medium saucepan. Add cherries; cook and stir over medium heat until mixture comes to a boil. NOTE: There will be no liquid to start with until heated. Remove from heat; stir in butter, extracts and food coloring. TO MAKE PASTRY preheat oven to 375F degrees. Combine flour, 2 tablespoons sugar and salt in a medium bowl. Add shortening; cut into flour mixture until crumbly. Add egg mixture slowly to flour mixture tossing lightly until dough ball forms. Divide dough into “thirds”; shape into 5-6 inch disks. NOTE: Wrap 1 in plastic wrap and refrigerate or freeze for later use. Roll 1 disk to fit a 9 inch pie plate; press and fit into plate. Roll the other disk to cover pie; cut shapes or vents for steam. NOTE: Diane cut out the word “OHIO” in her award winning pie. Fill pie shell with the cherry filling; lift the top crust onto the filled pie. Trim ½ inch beyond the rim of the pie plate; flute edges. FOR GLAZE brush top crust with the milk; sprinkle with sugar. Bake for 35 to 40 minutes until crust is golden brown and center is bubbly. You can learn how to make cherry pie recipes with ground cherries. Combine fruit water and salt in large heavy pan; bring to a boil. Combine and mix together sugar, cornstarch and enough water to make pouring consistency. Stir cornstarch mixture into boiling fruit; continue stirring until mixture boils again. Set off to cool; PREHEAT OVEN TO 400F degrees. Pour cooled fruit into 10 inch pastry lined pie shell using half of dough. Roll remaining half of dough to cover pie; trim and crimp edges and cut vents in top. Bake pie until lightly browned. Learn how to make cherry pie recipes mixed with other fruits. In a large saucepan combine pie filling, pineapple with juice, food coloring, sugar and cornstarch. Cook over medium heat until thick; remove from the heat and stir in Jell-o. Allow mixture to set to cool; stir in bananas and pecans. Divide mixture evenly between the two pie shells. Refrigerate until ready to serve; top with whipped topping to serve. Learn how to make cherry pie recipes with whipped cream. Soften gelatin in cold water; drain cherries reserving syrup. Add enough water to the cherry syrup to equal 1 cup; set aside. Cut cherries in small pieces; set aside. Combine cherry syrup mixture and lemon juice in a saucepan; bring to a boil. Remove pan from the heat; stir in gelatin until dissolved. Chill mixture until thickened but NOT set; beat with mixture until fluffy. Fold into mixture the cherries, walnuts and almond extract; set aside. In another bowl beat heavy cream and powdered sugar until thick. Fold whipped cream into cherry mixture; spoon fluff into baked pie shell. Chill at least 2 hours until firm; serves 8. This is how to make cherry pie recipes with canned cherries. Combine in a large bowl pie filling, cinnamon, salt and lemon juice; mix lightly. Spoon into pie crust lined pan; bake 20 minutes. Combine all the topping ingredients in medium bowl. REMOVE pie from oven; spread topping evenly over partially baked pie. Bake pie for an additional 15 to 30 minutes until top is golden brown. Store leftover pie in refrigerator; serves 8. Learn how to make cherry pie recipes with cream cheese and whipped topping. Combine flour, pecans and butter; blend well. Press mixture into bottom and up sides of pie plate; bake 25 to 30 minutes. Combine and blend with mixer the cream cheese and sugar until smooth. Fold the Cool Whip into the cheese mixture; pour into prepared pie shell. Top with pie filling; refrigerate. 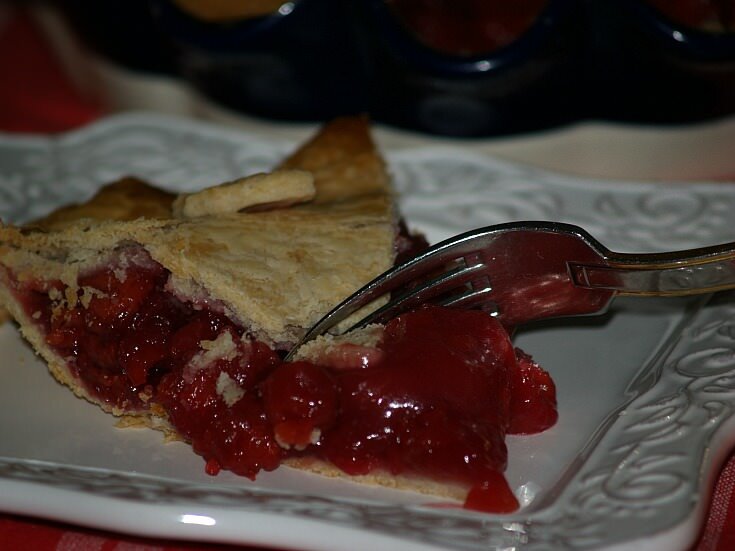 Florence Neavoll of Salem, Oregon learned how to make cherry pie recipes like this; another Crisco winner. TO MAKE CRUST combine flour and salt; cut in shortening. Sprinkle in cold water 1 tablespoon at a time tossing to make a dough ball. Roll dough to fit 10 inch pie plate; line plate, trim and crimp crust. Prick bottom and sides of shell with a fork; bake 10 to 15 minutes until golden brown. TO MAKE CREAM LAYER combine granulated sugar, cornstarch and salt in medium saucepan. Stir in half and half and the milk; cook and stir over medium heat until it comes to a boil. Boil for 1 minute; remove from heat and stir half of the mixture into the egg yolks. Mix well and return the mixture to the saucepan; blend well. Stir in butter and almond extract; cool to room temperature and then refrigerate. TO MAKE FILLING drain the cherries reserving ½ of the liquid. Pat the cherries dry with paper towels; set aside. Combine granulated sugar, cornstarch, flour and salt in a medium saucepan. Blend mixture until smooth; cook and stir over medium heat until mixture is thickened and clear. Add cherries to saucepan; cook and stir over low heat 10 to 15 minutes. Remove from heat; stir in amaretto, food coloring, lemon juice, vinegar and butter. FOR TOPPING combine gelatin and water in a very small saucepan. Cook and stir over low heat until gelatin dissolves; cool to warm but still LIQUID. Beat the whipping cream in medium bowl on high speed until soft peaks form. Slowly beat in the gelatin; beat in powdered sugar and almond. TO ASSEMBLE PIE spread cream layer in cooled pie shell. Cover with the cherry filling; pipe topping over the filling in a decorative fashion. Sprinkle the top with shaved chocolate and slivered almonds; refrigerate. Learn how to make cherry pie recipes with raspberries. Preheat oven to 400F degrees; line a 9 inch pie plate with pastry dough. Combine raspberries, sugar, flour and cherry filling in a large bowl; blend lightly. Spoon into pastry shell; top with remaining rolled dough. Trim edges and crimp around edges; cut slits in several places on the top. Bake for 40 to 45 minutes until lightly browned and filling is bubbly. NOTE: To prevent filling from bubbling all over oven, place pie on foil. Learn how to make cherry pie recipes with apples. Roll half of dough and line metal pie pan. In large bowl combine cherries and juice, apples, sugars, salt, spices, tapioca and food color. Blend mixture well and turn into lined pastry shell; roll remaining dough and top filling. Press edges to seal, trim, flute and cut slits in top for steam. Bake 10 minutes at 450F degrees; REDUCE HEAT to 375F degrees and bake additional 40 to 45 minutes.